With its enduring depiction of Seattle’s ‘grunge’ culture, the 1990s serial comic Hate benefitted by association with its location during its first 15 issues. However, when the suburban, slacker everyman, Buddy, returned to live with his family in New Jersey for the next 15 issues, Hate’s slapstick and tragic dynamics expanded to include three generations struggling to live the American dream and with each other. Issues 1-15 of Hate are collected in Buddy Does Seattle (2005) and 16-30 in Buddy Does Jersey (2007) both published by Fantagraphics Books. 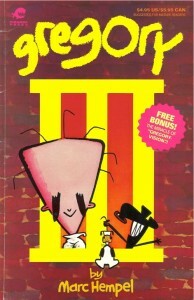 While comic book characters commonly have ‘funny’ shaped heads, Gregory is unique for depicting a mentally disordered, straightjacketed boy whose vocabulary is limited to grunts and shouting aloud his name repetitively. Still despite the unlikely setting for humour of his isolation cell, that doesn’t stop Gregory’s adventures or those of his visiting friend; Herman Vermin, a vain, grandiose, imaginary (or is he?) rat. The playful use of perspectives, including through Gregory’s eyes, enables readers to experience his tragic and hilarious humanity. Dramatic compression and expansion of the comic strip panels, the four walls of Gregory’s world, reveals him to be both oppressed and contained by his environment. Similarly, despite his ‘helpless’ state, Gregory has a profound effect on those he encounters in this sympathetic portrayal of the tensions and tedium within a psychiatric institution.